Experience the Difference of an Authentic Melamine Dinner Set Upgrade your dinnerware set” with one that blends superior durability, hassle-free maintenance, and rustic charm. Made using heavy weight melamine, these dinner plate and bowls are virtually unbreakable, keeps chips and cracks at bay, and can actually be cleaned in the dishwasher. Introduce some quirk to your dinner table with a beautiful melamine product that doesn’t cut corners. Dishwasher safe and 100% BPA-free. - Great for camping, RVs and outdoor use. Whether you’re going out camping, having an outdoor soiree, or setting off in your RV or trailer, our melamine plates and bowls complement it all with a touch of durability. Tough and hardy, this dinnerware set introduces a sense of normalcy to outdoor dining without any of the fragility. Dine in Style Quirky yet cute, vintage yet modern, this colorful melamine dinnerware infuses any setting with a charm that never quits. 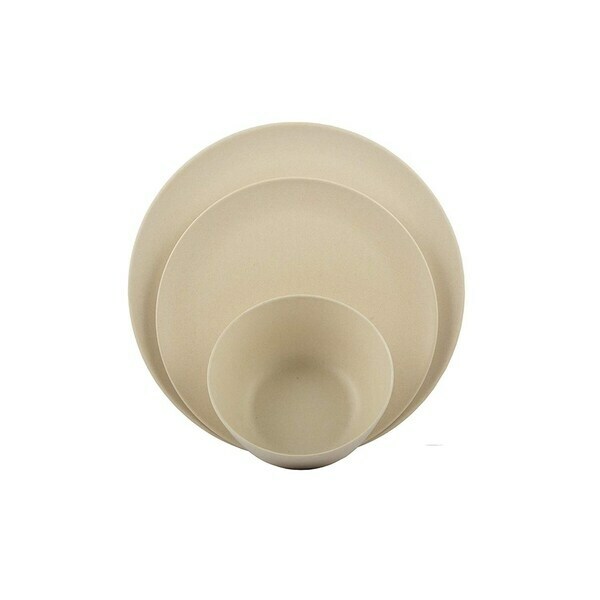 The plates and bowls come in multiple colors and design options and are crowned by beautiful asymmetry. About Melange, Melange dinnerware is all about treating you to everyday elegance. We believe fine dinner sets shouldn’t mean fragile dinner sets. We believe every meal should be complemented by dinnerware that makes you smile. That’s why we’ve used premium materials to bring on the durability, special craftsmanship to enhance the longevity, and lovely detailing to catch anyone’s eye." • HEAVY DUTY 100% MELAMINE: Unlike other melamine plates that scratch, break and chip due to their low 30%-60% melamine content, the MÃ©lange dinner set is crafted from 100% melamine that is thicker than most. This makes our melamine dinner set impressively shatter-proof, chip-resistant, and scratch-proof to treat you to extra durability. • GREAT EVERYDAY DINNER SET: This 36-piece rustic bamboo dinnerware set comes with (12) 11" dinner plates, (12) 9" salad plates, and (12) 18 oz bowls that are great for both indoor and outdoor use. The break-resistant design makes this a nice kids' bamboo dinnerware set and also makes it ideal for camping or for use in RVs and trailers. • CONVENIENTLY DISHWASHER SAFE: While low quality melamine plates & bowls can't be cleaned in the dishwasher, this premium 100% melamine dinnerware is uniquely dishwasher-safe (top shelf) to make clean-up a hassle-free affair. We've complemented the ease of maintenance with a BPA-free design to keep you and your family that much safer as you dine (NOT FOR USE IN MICROWAVE OR OVEN). • ALL ABOUT CHARACTER: Give your chow some charm with our melamine rustic dinnerware set. Our wide collection combines an eye-catching charming look with vintage colors and a nice modern shapes to accentuate any setting with a heavy serving of character. Get a set for yourself and another as a gift for that someone with a taste for the unique. • 100% SATISFACTION GUARANTEE: We're happy when you're happy. That's why we've backed this colorful melamine dinnerware set with our total satisfaction guarantee. If you have any questions or issues with your set simply reach out to us and we'll do all we can to make it right. Click 'Add to Cart' now and start dining in style!